Smallest is learning to read. 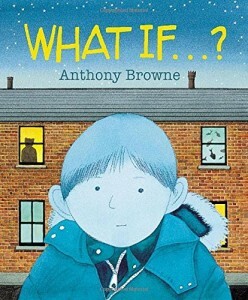 Last night, while we were reading the wonderful What If…? (Amazon link), I turned over a page and we were looking at the picture, and she read the caption before I even saw it. It’s a great book. I highly recommend it – lots to look at and talk about as you look through the . And the simple story, of the walk to a party, has got a surprising amount to discuss. If you’ve ever had a child nervous about a social situation, this may well be a good way into the topic. And if that’s never been a problem, just enjoy the somewhat surreal imagery. I particularly enjoyed the Tudor children, can’t think why. Although the elephant is rather fun too. I love Anthony Browne. I have three books here from about 25 yers ago – The Mummy Book, Look What I’ve Got, and The Piggy Book. All excellent, with a sound message, and funny, querky pictures. He once came to Jerusalem and we went to see him speak. Love him.